I love Nordstom. Love. There was a HUGE one in the mall by my house growing up. I remember going in there. Knowing we couldn't afford it. Which didn't really bother me, but somehow Nordstrom was a symbol. If I could afford Nordstrom, then I must've made it. Cause that's my 14 year old self's definition of success. Apparently. But we were poor. I had no idea how poor until I was older. I just knew I didn't get everything I wanted. I think if we were rich I wouldn't get everything I wanted either. But we were poor enough that we HAD to thrift store shop. And I got good at it. Real good. Years later I no longer have to buy second hand (course I'd have fewer clothes...), but I still do cause I love. I love the amazing things that I can find, spending a small percentage of what it would cost straight from the store. Lovely, right?! 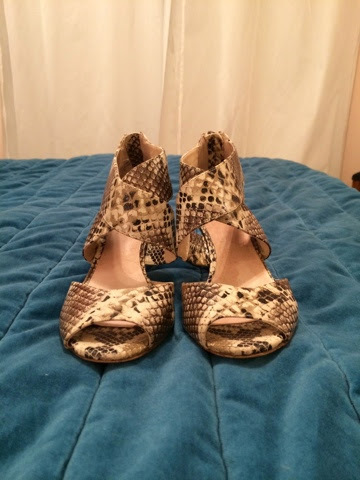 Cause I totally need another pair of snake skin shoes. 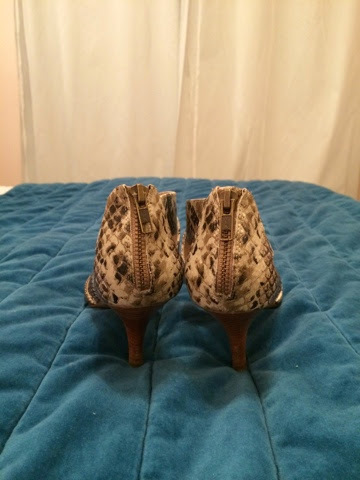 I only have three others...holy cow, I have three pairs of snake skin shoes! I guess I like the idea of them dead on my feet, not slithering around. Course none of mine are real snake...but the idea is the same, on my feet, not on the ground. I digress, I liked this shoe. It was versatile and had a low heel without looking lame. Now with a babe in tow I rarely wear tall heels, so I needed some in the low/mid range. These were perfect. And $250. $250? Heck no. To put the in perspective, I bought my entire bedroom set (from craiglist...I don't shop for deals for just clothes!) for $200. Not including the mattress, of course. There are some things I don't do second hand. They're Aldo brand. Not as nice as the Nordstrom pair, but they're still a great brand, in amazing shape and were like 3% of the cost....er, something like that. I've worn them a few times and have gotten multiple compliments. The best part? Saving like this lets me afford way more quantity wise, but also lets me splurge on the occasional item :). *I was not compensated for this post, but was invited to participate in the Splurge vs. Save campaign by Credit Card Insider. Something I was excited to do because I believe being fiscally responsible is so important, but it's possible to be responsible and get what you want!